New York, 27 June 2018 – The number of children affected by armed conflict and the severity of grave violations affecting them increased in the past year, concludes the annual report of the Secretary-General on children and armed conflict released today. Statement by Ms. Virginia Gamba, Special Representative of the Secretary-General for Children and Armed Conflict Arria Formula Meeting on the issue of attacks on schools. 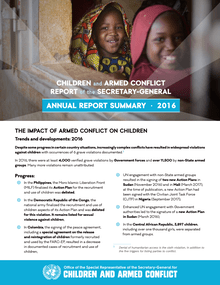 New York, 5 October 2017 – Boys and girls living in countries affected by armed conflict have been victims of widespread violations in 2016, as documented in the Secretary-General’s Annual Report on Children and Armed Conflict released today and covering the period from January to December 2016. Chief Child Protection Advisers (CPA) from Somalia, the Democratic Republic of the Congo and Afghanistan were gathered in New York on 19 September to brief Member States, Officials and Partners on the crucial transversal work done by CPAs in the field to better protect children living in areas affected by conflicts. It is a pleasure to be here with Ms. Santos Pais for my sixth interactive dialogue. This will be the final time I address the Council. I would like to take this opportunity to say that it has been a pleasure working with you all. The senior United Nations advocate for children caught up in conflict is reaching out to parents, elders, and the entire international community to keep children away from armies and militias – a UN role that over the past two decades has helped more than 115,000 child soldiers regain their youth. 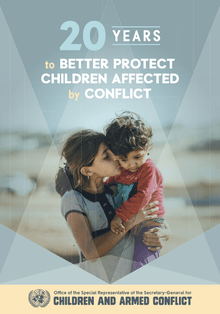 Twenty years ago, the General Assembly recognized the unique predicament of children caught up in conflict, and created the mandate of my Special Representative for Children and Armed Conflict (CAAC). New York – In her annual report to the Human Rights Council, the Special Representative of the Secretary-General for Children and Armed Conflict highlighted the progress accomplished since the creation of her mandate twenty years ago, but also urged Member States and parties to conflict to take immediate action to end persistent grave violations against children. In 2016, there were at least 4,000 verified grave violations by Government forces and over 11,500 by non-State armed groups. Many more violations remain unattributed. KABUL - A few days before I was scheduled to travel to Afghanistan, I read about the death of Wasil Ahmad. You may remember him. Wasil was an 11-year-old Afghan boy, described as a hero by some in his community for helping fight the Taliban. According to the news reports, he took up arms last summer, reportedly after a member of his family was killed. Earlier this year, he was gunned down on his way to school in an act of revenge by the Taliban. Jalalabad, Afghanistan – Last month, in Afghanistan, a new child protection unit – the sixth in the country- opened in the National Police Recruitment Centre in Jalalabad, a city located about 150 km east of the capital, Kabul. The main objective of this unit is simple but crucial: to prevent the recruitment of children into the Afghan National Police. New York – During a mission by Leila Zerrougui, the Special Representative of the Secretary-General for Children and Armed Conflict, the Afghan Government reiterated its commitment to fully implement its Action Plan to end and prevent the recruitment and use of children in the national security forces. New York – Increasingly complex and widening conflicts have taken a huge toll on children in much of the Middle East in 2015, with parts of Africa and Asia facing protracted and relapsing wars that show no signs of abating, wrote Leila Zerrougui, the Special Representative of the Secretary-General for Children and Armed Conflict, in her annual report to the Human Rights Council. The Report covers the period from December 2014 to December 2015. New York – As we mark the International Day against the Use of Child Soldiers, tens of thousands of boys and girls are associated with armed forces and groups in conflicts in over 20 countries around the world. “Again this year, the multiplication of conflicts and the brutality of tactics of war have made children extremely vulnerable to recruitment and use,” said Leila Zerrougui, the Special Representative of the Secretary-General for Children and Armed Conflict. The Special Representative of the Secretary-General for Children and Armed Conflict, Leila Zerrougui, today expressed serious concern over grave violations against children during ongoing hostilities in Kunduz, in north-eastern Afghanistan. In a bid ultimately aimed at having Afghanistan’s armed insurgency groups accept the need to end violations against children, Leila Zerrougui is urging the Government of Afghanistan to inject child protection measures into any further negotiations that flow from its first direct talks with Taliban representatives. The UN Secretary-General’s third report on children and armed conflict in Afghanistan, released today, recalls how 2014 saw more children killed or maimed amid rising conflict there than in any of the previous seven and a half years of monitoring in the country – but also highlights the Government’s progress towards ending and preventing recruitment and use of children. A Year of Progress for "Children, Not Soldiers"
One year ago, representatives of the last eight governments of the world named by the UN Secretary-General for the recruitment and use of children in their security forces gathered at the United Nations in New York to declare they were ready to take the steps necessary to make their security forces child-free. Ten years ago, on 22 April 2004, the UN Security Council adopted resolution 1539, which called on all parties listed for recruitment and use of children in the annexes of the Secretary-General’s report on children and armed conflict to “prepare […] concrete, time-bound action plans to halt recruitment and use of children […], in close collaboration with United Nations peacekeeping missions and United Nations country teams”.